A woman was left "in shock" after finding a note on her car branding her a "fat lazy cow" following a row over parent and child parking spaces. Ayesha Chambers visited a branch of Tesco in Cirencester, Gloucestershire, on Monday with her partner and son. When she arrived there was a dispute with another car park user, and she found the message attached to her windscreen when she returned home. Tesco said measures are in place to ensure spaces are not abused. "It's just rude. I was in shock," Ms Chambers, from Cirencester, said. 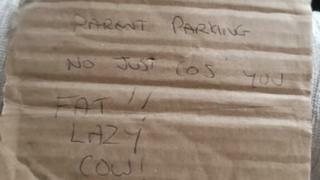 The note read: "Parent parking, no [sic] just cos you fat, lazy cow!" "If we didn't have a child with us in the car then I could understand the anger, but we had our son with us and people could see that," said Ms Chambers. Her car also has a sticker on the rear window and a visible child seat. Ms Chambers said she "completely understood" notes left for people who park badly, but added: "We were entitled to be there. "There could have been a note politely asking where our child was but instead we got this. "It's irrelevant, uncalled for and pointless." Tesco said: "We are sorry to hear that one of our customers found an abusive note left by a member of the public on the windscreen of their vehicle at our Cirencester Extra store. "We provide dedicated parent and child parking spaces within the car parks of our large stores and have measures in place to police those spaces to ensure they are not abused."